The XAU/USD (Gold Price) extended losses on Monday in what has now become a 5-day streak of declines. The yellow metal’s current trend appears to be forming what could turn out to be a bearish triangle breakout with the base becoming flat while the trendline up top continues to experience a series of lower highs. 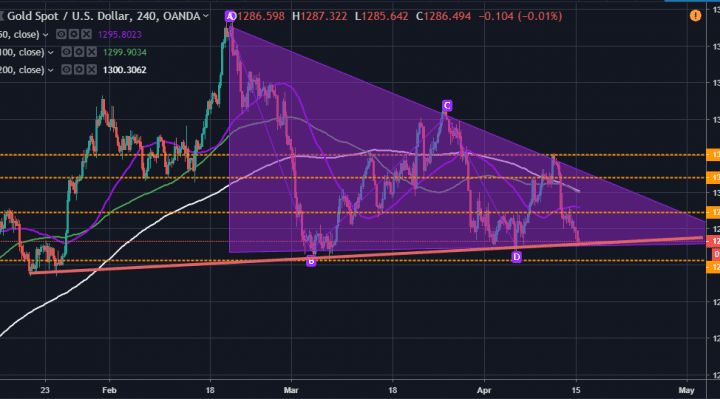 The latest pullback in the price of gold took the XAU/USD below the $1,290 level with the $1,280 mark now becoming an interesting prospect for the bears. From a fundamental perspective, the price of gold in the USD terms (XAU/USD) relies a lot on the performance of the US economy. An increase in real interest rates affects the gold price negatively as does a booming US stock market due to the yellow metal’s safe haven status. After the US Federal Reserve declared that there will be no rate hikes this year, the yellow metal enjoyed a momentarily boost resulting in a major rebound in price. However, after the release of the NFPs and the latest weekly jobless claims data, investors appear to have regained optimism resulting in the current pullback in the price of gold. This topsy-turvy movement could continue through the rest of the month and potentially the first half of 2019. Technically, the XAU/USD price currently appears to be trading in a triangle formation. And since it recently touched the lower trendline, the next thing now inevitably appears to be a rebound back towards the upper trendline. However, it could make a temporary stop somewhere in the middle as illustrated in the 240-min chart, which would be ideal for the bulls to target for profits at around $1,294 level before heading towards $1,304. On the other hand, the bears will hope the current trendline support does not hold and that the pair breaches it and heads downwards towards the $1,280 level. 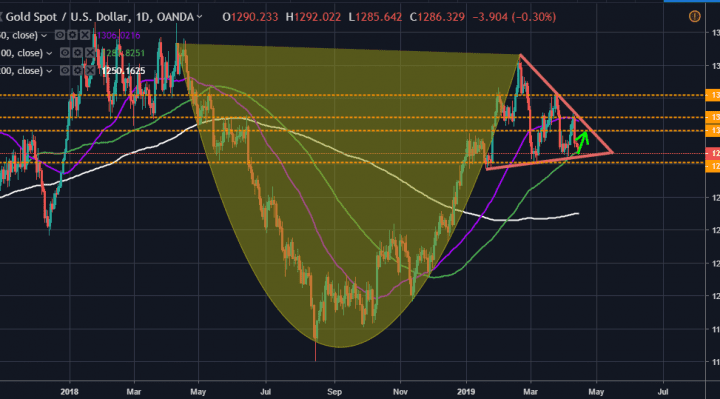 In the daily chart, the price of the yellow metal appears to be about to complete a cup and handle pattern formation, which could result in a breakout. And based on the current price level, it looks like there is an immediate rebound due to happen soon after the XAU/USD touched the baseline of the handle formation. This creates several trading opportunities for the bulls as they target profits at around $1,300, $1,308 and $1,320. On the other hand, the bears will hope for an extension of the current decline towards $1,280. In summary, the price of XAU/USD (Gold) appears to have a short-term bullish bias, but in the long-term, the picture could change significantly. Interesting times lie ahead for the yellow metal traders.